The University of Nigeria is a federally-controlled public university located in southeastern Nigeria. The university has three campuses: Nsukka (the main campus), Enugu, and Ituku-Ozalla. It was the first university opened by newly independent Nigeria. Dr. Nnamdi Azikiwe, the first President of Nigeria, was one of the university’s pioneer supporters. Azikiwe, who studied at Lincoln and Howard Universities in the United States in the 1920s, envisioned an institution patterned along the lines of American colleges and universities. In 1955 while Nigeria was still a British Colony, the Colonial Assembly passed legislation authorizing the creation of a university in eastern Nigeria during the period when Azikiwe was then Premier of the Eastern Region. Soon afterwards an invitation was sent to the United States and the United Kingdom to send advisors to help in the planning of the campus and curriculum of the new institution. The Inter-University Council for Higher Education Overseas and the International Co-operation Administration (now the United States Agency for International Development or AID) responded by sending Dr. John A. Hannah, President of Michigan State University and Dr. Glen L. Taggart, the Dean of International Programs at the same institution, to Nigeria in 1958 to aid in the design and development of the proposed university. Mr. J.W. Cook, Vice Chancellor of the University of Exeter represented Great Britain in this endeavor. Hannah, Taggart, and Cook selected the present location at Nsukka and planned facilities and curriculum that they believed would meet the needs of the newly emerging nation. On October 7, 1960, one week after Nigeria was declared independent of Great Britain, the University of Nigeria was formally opened by Her Royal Highness, Princess Alexandra of Kent, who represented Her Majesty Queen Elizabeth II. Classes began on October 17, 1960 with 220 students and 13 faculty and staff. The campus grew rapidly from that point. As of 2009 it had approximately 36,000 students, both undergraduate and postgraduate, and 1,700 faculty and staff. The main campus at Nsukka houses the College of Agriculture (with an experimental agricultural farm), Arts, Biological Sciences, Education, Engineering, Pharmaceutical Services, Physical Services, Social Sciences, and Veterinary Medicine. The Law School which was established in 1960 is the oldest in Nigeria. 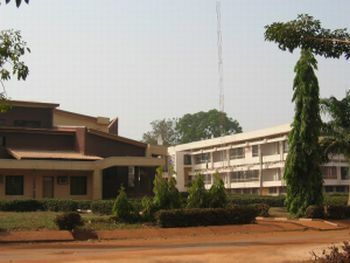 The former Nigerian College of Arts, Science and Technology, Enugu campus, was incorporated into the University in 1971 and the Medical School is located there as well. The University of Nigeria Teaching Hospital at Enugu was opened in 1965. The first open heart surgical operation in Nigeria took place there in 1974. The present Teaching Hospital is located at Ituku-Ozalla, about fifteen miles south of Enugu. Among the University alumni are Obiageli Ezekwesili, a Vice President of the World Bank, Tunde Lemo, Deputy Governor of the Central Bank of Nigeria, and four former Nigerian state governors. Renowned astrophysicist Samuel Ejikeme Okoye founded the University’s Space Research Center in 1972. This program offers one of the few courses in astronomy in Nigeria. Also, noted author Chinua Achebe held teaching and research appointments at the University from 1960 to 1990.